Until recently, the U.S. Commodity Futures Trading Commission’s (“CFTC”) Dodd-Frank Whistleblower Program had only paid out two whistleblower awards, totaling $530,000 ($290,000 and $240,000, respectively), over the entire life of the program. However, that changed significantly when the CFTC announced that it had agreed to award approximately $10 million to a whistleblower who the CFTC said provided “key original information that led to a successful CFTC enforcement action” under the Commodity Exchange Act (“CEA”). The CFTC Whistleblower Program was established by section 748 of the Dodd-Frank Wall Street Reform and Consumer Protection Act of 2010 (“Dodd-Frank Act”). The CFTC Whistleblower Program “pays monetary awards to eligible whistleblowers who voluntarily provide the CFTC with original information about violation of the CEA that leads the CFTC to bring a successful enforcement action resulting in monetary sanctions exceeding $1,000,000.” The program also pays monetary awards to eligible whistleblowers whose information leads to the successful enforcement of a related action brought by another government agency. However, the related action must be “based on original information submitted to the CFTC,” and the CFTC must also bring “an action based on that same information” in order for an award to be paid. Under the CFTC Whistleblower Program, eligible whistleblowers may receive between 10 percent and 30 percent of the monetary sanctions collected. All whistleblower awards are paid from the CFTC Customer Protection Fund, which was established by Congress and funded entirely through monetary sanctions paid by CEA lawbreakers. Furthermore, no money is taken or withheld from harmed investors to fund the CFTC whistleblower program. “By providing robust financial incentives and enhanced protections to whistleblowers, the Commission incentivizes people to come forward with high quality information about serious violations of the law that we might not otherwise uncover. An award this size shows the importance that the Commission places on incentivizing future whistleblowers,” said Aitan Goelman, Director of the CFTC’s Division of Enforcement. In addition to the CFTC Whistleblower Program, the IRS and the SEC both have established whistleblower programs as well. The SEC Office of the Whistleblower was created by the same legislation as the CFTC Whistleblower Program, and shares essentially the same regulatory scheme as the CFTC program. The IRS Whistleblower Office, established by the Tax Relief and Health Care Act of 2006, is somewhat similar to the CFTC and SEC whistleblower programs, except that the IRS Whistleblower Office rewards individuals with 15 to 30 percent of the recovery when the individual’s original information has led to an IRS enforcement action in which more than $2 million (including taxes, penalties and interest) was ordered. While the CFTC and SEC whistleblower programs have a shared origin and essentially the same regulatory structure, they have proceeded at different speeds during their six-year existence. The SEC Office of the Whistleblower wasted little time in embracing whistleblower information as a way to jumpstart its enforcement activities, while at the same time paying sizeable awards for whistleblower information. In fact, since 2010, the SEC Office of the Whistleblower has issued 20 final orders approving awards to 22 individuals for a total of $54 million. Just in 2015 alone, the SEC paid over $37 million to whistleblowers. For example, in April 2015, a compliance officer-turned-whistleblower received an award between $1.4 million and $1.6 million. So far in 2016, the SEC has already ordered two awards, including one for $700,000 to a company outsider who conducted a detailed analysis that led to a successful SEC enforcement action. The aforementioned significant awards, and the resulting publicity from those awards, have resulted in a major uptick in whistleblower tips provided to the SEC. In 2015, the SEC reported that they received almost 4,000 whistleblower tips, which represented a 30 percent increase since 2012. As a result, the SEC has been able to initiate more investigations, as well as make substantial financial recoveries as part of their enforcement efforts. SEC Chair Mary Jo White has stated that “the [whistleblower] program is a success — and we will work hard at the SEC to build on that success.” Similar to the SEC’s efforts, the IRS Whistleblower Office has awarded over $315 million to 500 whistleblowers between 2011 and 2015. The CFTC’s efforts to incentivize potential whistleblowers to provide information of wrongdoing have been much slower. As noted, the CFTC paid a $240,000 award in 2014, and then a $290,000 award in 2015. But that was it until this most recent $10 million award. 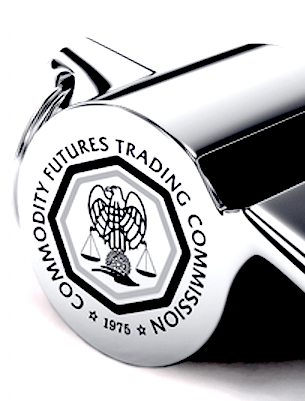 The small number of awards paid, along with the amount of those awards, may have signaled to those in the commodities futures world that the CFTC was not as interested in the role of whistleblower information as either the SEC or the IRS. Furthermore, in 2013, the CFTC publicly admitted that its view for “right now” was that “we don’t enforce” the anti-retaliation provision of Dodd-Frank. These statements may have had a chilling effect on potential whistleblowers, resulting in less reports of wrongdoing. But whatever the explanation is for the CFTC’s sluggish start, the most recent whistleblower award is a game changer. While the law prohibits the CFTC from disclosing information that might directly or indirectly reveal a whistleblower’s identity, simple math tells us that the CFTC must have recovered between approximately $33.5 million and $100 million to result in such an award. If you or someone you know has information regarding violations of the CEA or violations of other related agency statutes, please contact our whistleblower team for a consultation. Your identity, as well as the information you provide, will be kept confidential, and your employer will not be allowed to retaliate against you based upon the information you provide. Additionally, the dramatic increase in the size of the awards the CFTC is willing to pay represents a significant incentive to blow the whistle on violation of the CEA.